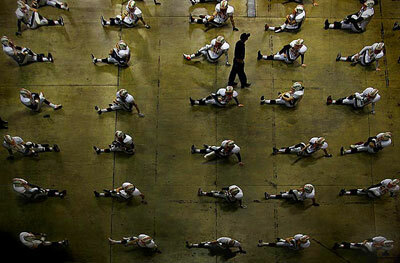 The 8th Annual Sports Shooter Contest was judged on April 21, 2006. The judging panel of Wally Skalij (Los Angeles Times), Myung Chun (Los Angeles Times), Matt A. Brown (Los Angeles freelance photographer), Rick Rickman (freelance photographer and Brooks Institute faculty member) and Robert Hanashiro (USA TODAY), spent the day together working to decide the winners in five categories and select a "Picture of the Year" (best entry). The entire judging was open to spectators at Brooks Institute of Photography in Ventura, California. The contest was made possible by donations from Nikon and Samy's Camera. Special thanks to Jim McNay and Brooks for hosting the judging! LOS ANGELES, CA - 19 MAR 2005: An unknown bystander looks at World Sumo Champion & Japanese National Champion Koichi Kato as he takes an escalator to the competition floor during the US Sumo Open at the Los Angeles Convention Center on March 19, 2005 in Los Angeles, California. Kato won the overall competition later that day. Visalia, CA. 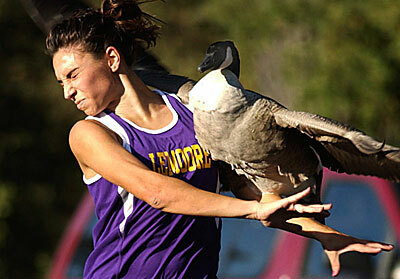 - 10/12/2005: Lemoore High School cross-country runner Brianna Horvat collides with an aggressive Canada goose near the finish line at Mooney Grove Park. Horvat placed 7th in the meet against Mt. Whitney High School. Sydney, Australia - 31,7,2005: Ill feelings among South Sydney players boiled over after Braith Anasta signalled his intentions to play for the Roosters instead of Souths, the club that had given him his footy legs as a junior. The South Sydney crowd booed every time Anasta touched the ball and this serious incident, an eye gouge, did not end up before the judiciary. South Sydney defeated the Bulldogs (defending premiers) 37-24 in the National Rugby League clash at Aussie Stadium. The image shows the moment of impact when the offending player (Bryan Fletcher)found his mark. The injury to his eye resulted in a black eye that took two weeks to heal. Wayne State's Taylor Donohoe's stick gets caught under the helmet of UNO's Anthony Adams while Wayne State's Dan Iliakis hits him from the other side. 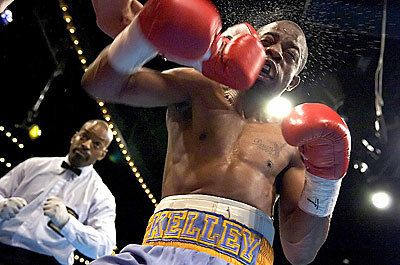 Kevin Kelley (R) is caught by Felix St. Kitts during their 8 Rounds Jr. Welterweight fight at Madison Square Garden in New York City on March 3rd, 2005. Kelley won the fight by a 8th round TKO. SANTA CLARA, CA - 26 June 2005: World Record Holder Aaron Peirsol streamlines off the wall as he swims backstroke during the Santa Clara Grand Prix on June 26, 2005 at the Santa Clara Swim Club Aquatics Center in Santa Clara, California. 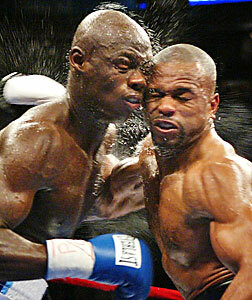 Tampa, FL - October 1, 2005 - Antonio Tarver (l) and Roy Jones Jr. (r) clash heads during their 12 round rubber match at the St. Pete Times Forum in Tampa, FL. Tarver won the decisive match with a 12 round unanimous decision. 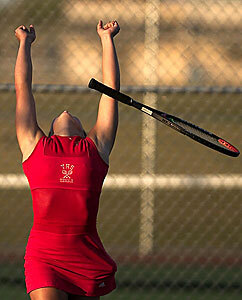 Vineland's Kristen Pirolli reacts to winning against Cherry Hill East's Joelle Copeland during their third singles match on Monday, Oct. 17, 2005 in Williamstown. Portland, OR - 1/18/2005: Patrol cars, mounted police and plenty of extra security were in place. The gym was already packed to capacity just as the JV game was wrapping up. Echoes started to come from a corner stair well. 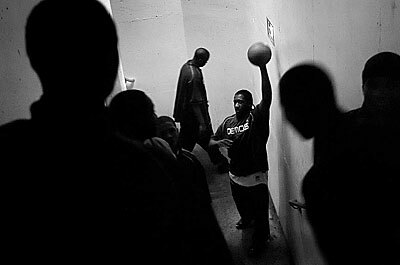 The big men had taken their place at the bottom of the stairs to lead their team in a rendition of "It's Goin' Down" in their pre-game ritual. "It's become a tradition to help our team take care of the nerves before each game," says Junior Markhuri "Big Mac" Sanders-Frison. Mountain Crest's Kim Olsen reacts in disbelif after getting called offsides against Logan August 11, 2005 in Logan Utah. 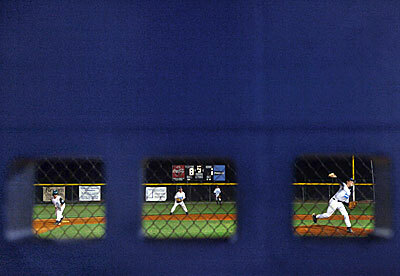 Windows of Opportunity -- As seen through holes in the visitor's dugout, the Manatee East and the Braden River All Star Little League teams battle it out during their matchup at G.T. Bray Park in Bradenton, Florida. 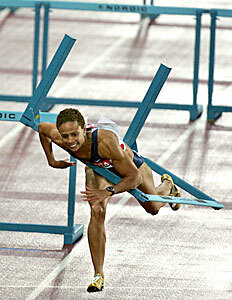 Joanna Hayes of USA falls over the hurdle during the women's 100 metres Hurdles final at the 10th IAAF World Athletics Championships on August 11, 2005 in Helsinki, Finland. 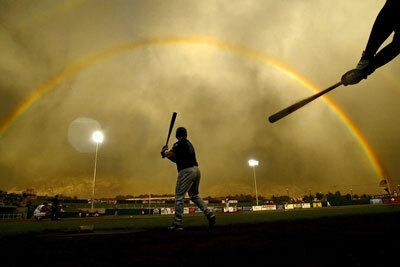 A rainbow stretches through the Utah Sky as Ogden Raptor Jason Mooneyham warms up in the on deck circle before his turn to bat against the Orem Owlz during the Southern Division Playoffs. The Raptors lost 2-1 and Mooneyham batted 0-3 with 2 strike outs during the game. 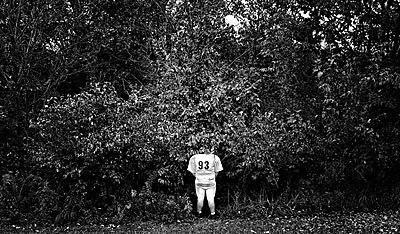 Fairfield, PA - 10/17/05 - Fairfield sophomore Seth Mon relieves himself along the tree line during a recent football practice at the baseball field above the middle school in Fairfield. Mon and his teammates are forced to practice on the baseball field as the football stadium is being constructed. 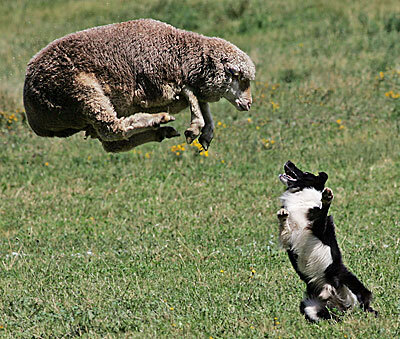 Meeker, CO - 9/9/2005: Jack, a border collie, owned and handled by Jeanne Weaver of MI, goes eye to eye with a ewe trying to jump over him to join the other sheep during the shed phase of the course during the first round of competition at the Meeker Classic Stockdog Trial. Fort Bragg, N.C. - 9/3/2005: Sgt. Eric Woody preps his horse for the ride across Fort Bragg, N.C., to the new riding stables at Smith Lake, Sept 3, 2005. The site of the old stables will be torn down to make way for facilities for the 4th Brigade Combat Team. 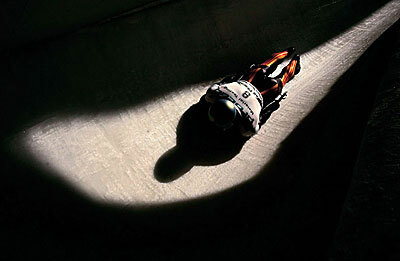 LAKE PLACID, NEW YORK - FEBRUARY 11: Florian Grassi of Germany slides down the track during the FIBT Bobsled and Skeleton World Cup at the Verizon Sports Complex on February 11, 2005 in Lake Placid, New York. 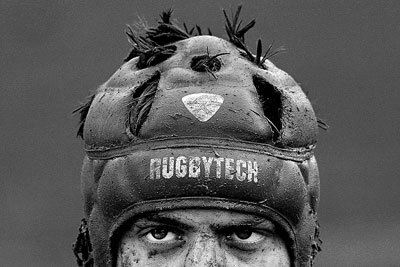 Harrisonburg, VA - 4/2/2005: Pete Perantonakis, known by his teammates as "Brutus," comes off the field during a muddy rugby match. His team won the match 24-12. Kansas City, Kansas--March, 12, 2005--Greyhound Fandemonium, #4, races behind Santa Fe Madonna, #7, during the sixth of fifteen races at The Woodlands race track. Fandemonium came from behind and finished in fourth place to defeat Santa Fe Madonna with a time of 31.34 seconds. 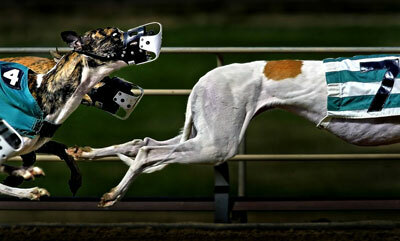 Greyhounds can reach top speeds of around 45 mph during the races. Visalia, CA. - 3/7/2005 - Monica Calderon of College of the Sequoias diving team submerges herself in the warm tub outside the COS swimming pool. 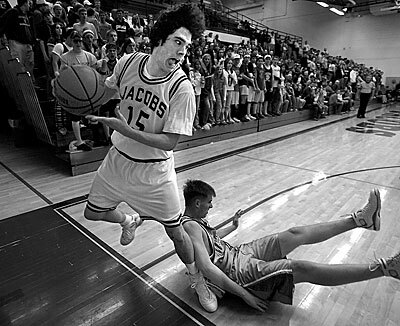 Algonquin, Ill. - 12/23/05: Jacobs senior Mike Steib saves a ball during the third quarter against Marian Central during the Golden Eagle Classic Holiday Tournament at Jacobs High School Friday night in Algonquin, Ill. Jacobs held off a fourth quarter run by Marian to win 65-61. Coach Ray Cox of DeSales high school leads his team in a pre-game stretch before the start of the semi-finals in the Tacoma Dome, Saturday November 26, 2005. 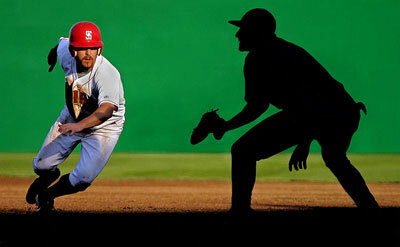 Spokane WA-061505-- Spokane Indians German Duran dashes back to first base after a quick move by the pitcher during the seventh inning against the Eugene Emeralds at Avista stadium in Spokane Washington. Eighteen-year-old Cory Owens works with his greyhounds at the dog track, but he gains much more than a paycheck. This is a photo essay for a tabloid special section depicting a certain aspect of each hole being played in the 2005 Champions Tour FedEx Kinkos Classic at The Hills Country Club in Austin, TX.